It began with a guest speaker in her small upstate New York town. Roshan Houshmand’s uncles were visiting, and because of their engineering background, she thought a talk on physics would be ideal for a night of entertainment. From collision site details at 5-minute exposures. 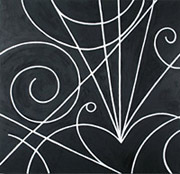 This painting contains interference blue, a luminous blue that is visible only when painted over black paint. It began with a guest speaker in her small upstate New York town. Roshan Houshmand’s uncles were visiting, and because of their engineering background, she thought a talk on physics would be ideal for a night of entertainment. Growing up with a chemical engineer as a father and various other family members as medical professionals, Houshmand always felt a connection to science; however, she didn’t pick the field for herself, earning bachelor’s and master’s degrees in the fine arts. After studying in the United States and Italy, the Iranian-American artist focused some of her first works on still life, constructivism, flowers, and lightning. Although Houshmand looked forward to discussions about science and philosophy with friends, it wasn’t until hearing this pivotal talk, by physicist Brian Greene, that she turned back to her family’s scientific roots. From there, Houshmand launched into a five-month crash course in physics, reading everything from textbooks to Greene’s The Elegant Universe. 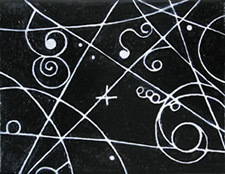 From bubble chamber images that suggest a map of the cosmos. One has a much denser surface, in which wax is mixed with the oil paint. The painting questions the weight or weightlessness of the trail. An organic-oriented composition in which the expansive arrangement of particle trails suggests the abundance of summer. 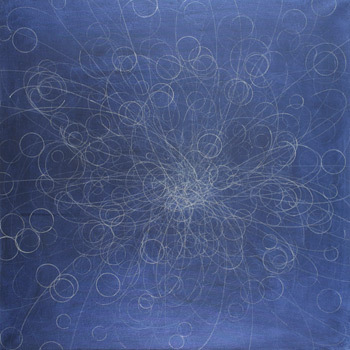 Yet among the intricate formulas and theories, Houshmand found inspiration for her latest work: bubble chamber photographs taken at Brookhaven National Laboratory and CERN, the European particle physics lab, in the 1960s and ’70s. The chambers, which were filled with liquid hydrogen, tracked otherwise invisible charged particles as they zoomed through the detectors, leaving trails in their wakes. 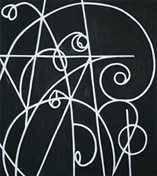 These bubble spirals, curves, and lines are the basis for Houshmand’s collection Event Paintings, which she began in late 2005. The composition and color come from examining the historical (social/cultural) context of the particle chamber images. 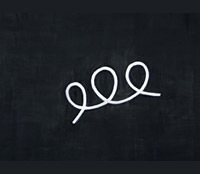 Using “cold black” paint as a primer–the name refers to a black that is actually a very dark blue–she sketches the event with chalk. Once the outline is perfect, she traces it with oil paint, usually white, although sometimes in pinks, blues, and other hues. She also uses wax on some paintings to add texture. On average, each piece takes two to three months to finish. 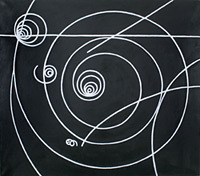 As Houshmand continues her bubble chamber collection, which she hopes will eventually include both large (5 feet by 5 feet) and small (6 inches by 8 inches) pieces, she has started to exhibit them. She also continues to research physics and other sciences, looking for further visual representations. While she admits to being nowhere near an expert in the field, Houshmand says one of the biggest lessons she’s learned is that artists aren’t so different from scientists after all. 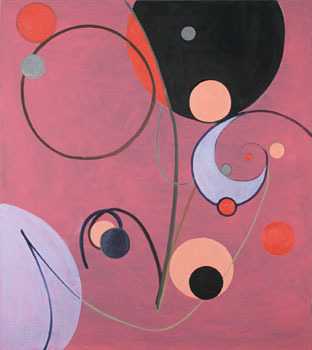 This painting was inspired by the omega-minus particle in a bubble chamber. 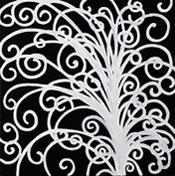 The spirals offer a great sense of depth, which naturally leads the viewer into a soothing space that contradicts the completely flat contextual surface. This was the first painting of the series, and Houshmand felt it important to acknowledge in the title that although she was using real event images as sources of information, she altered the imagery; hence theoretical event. The title comes from a Dr. Seuss character whose hair has the same effusiveness as the trails.